"This was given to me by a friend, who got it from a little pasta house restaurant in her hometown. 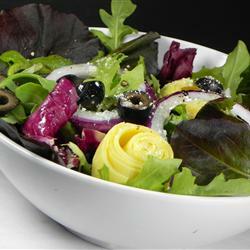 It calls for mixed greens, red onion and artichokes with a vinegar and oil dressing." In a large bowl, combine the mixed greens, onion, and artichoke hearts. In a medium-size mixing bowl, whisk together the oil, vinegar, seasoned salt, pepper, and garlic. Pour enough dressing over salad to coat, and toss well. Sprinkle with grated cheese, and serve.